Super Glue (cyanoacrylate) fuming by using a concept called "Increasing the Surface Area". Developed by John H. Olenik, retired criminalist/latent print examiner, who conducts Super Glue workshops throughout the U.S. This technique involves the spreading of the cyanoacrylate out as a thin film so the adhesive can evaporate (vaporize) rapidly. 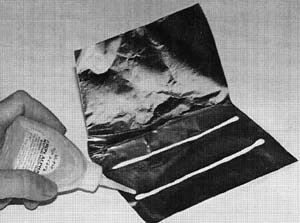 This was commercially developed by Locktite Corporation and sold as "Hard Evidence", with several replicas on the market. To make your own, which will generate CA fumes as well as the commercial products, just cut out a piece of aluminum foil (heavy duty type) 15 cm x 20 cm (6" x 8") and make a widthwise crease down the middle. The cyanoacrylate (a gel or high viscosity works best, such as Aron Alpha Gel 10) is placed on the aluminum foil, midway between the edge of the foil, and 12 mm (1/2") in from the edge. 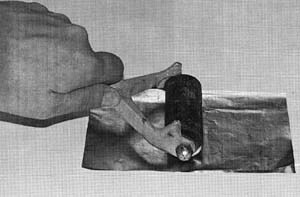 The foil is folded over onto the cyanoacrylate bead, and a fingerprint ink roller or similar cylindrical object is rolled on the foil to evenly distribute the CA. Items to be fumed should be positioned in the chamber first, along with a cup of warm water, depending on the humidity level (80% is ideal). The fuming process starts as soon as the foil is pulled apart. Latent prints can be developed in 15 minutes. The CA treated foil should never be left in a small chamber for more than 30 minutes, because over development will occur. This technique works best when used with a small fan to evenly distribute the resulting fumes. This technique is very temperature sensitive and works best at room temperature. This method is excellent when used in conjunction with a Super Glue vacuum chamber.